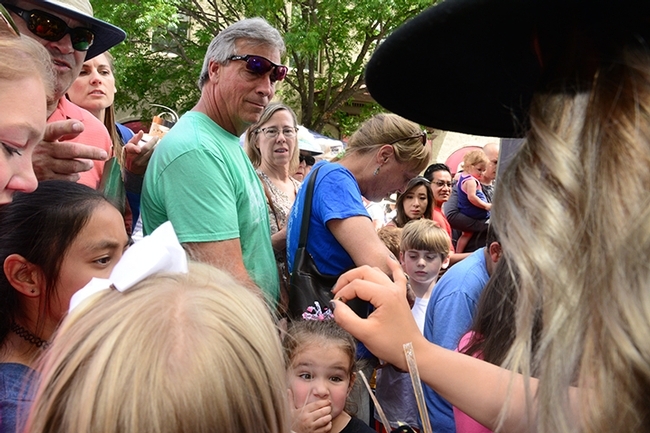 If you attended the second annual California Honey Festival, held recently in downtown Woodland, you probably heard the buzz. Or at least you saw the crowd circling Extension apiculturist Elina Lastro Niño of the UC Davis Department of Entomology and Nematology. 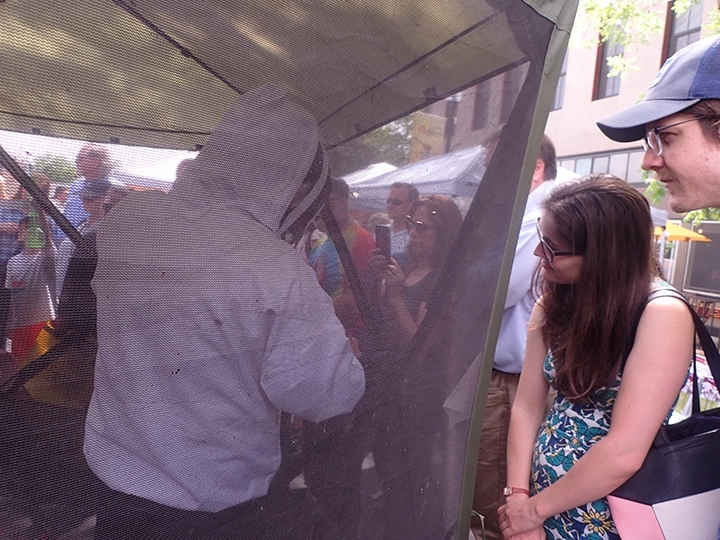 The bees buzzed and so did the festival-goers. Niño presented several "live bee" demonstrations in a circular screened tent. She opened the bee hive, pulled out frames, and showed the crowd the three castes of bees: the queen, worker bees and drones. 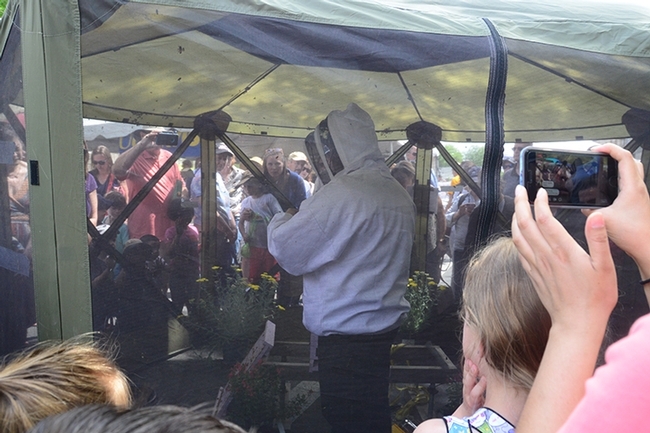 Niño talked about beekeeping and what bees need, and then passed a couple of drones through the tent to the crowd. Some gasped, not realizing that drones are males and cannot sting. Other marveled at the docile drones, took cell phone photos and petted them. The drones didn't seem to mind! All in all, it was a great day for bees at the California Honey Festival, which is annually sponsored by the UC Davis Honey and Pollination Center and the City of Woodland. Bee enthusiasts created the festival in 2017 to cultivate an interest in beekeeping, and to educate the public in support of bees and their keepers, said Amina Harris, director of the Honey and Pollination Center. 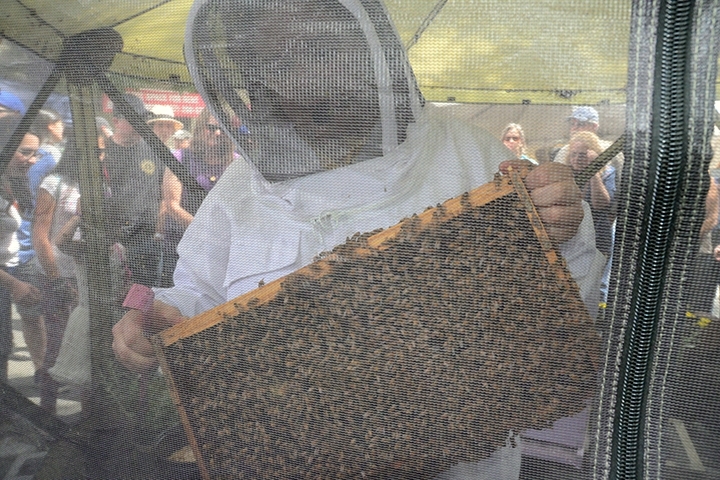 "Bees face many threats today—it is the goal of the festival to help attendees understand the importance of bees to food diversity in the United States." 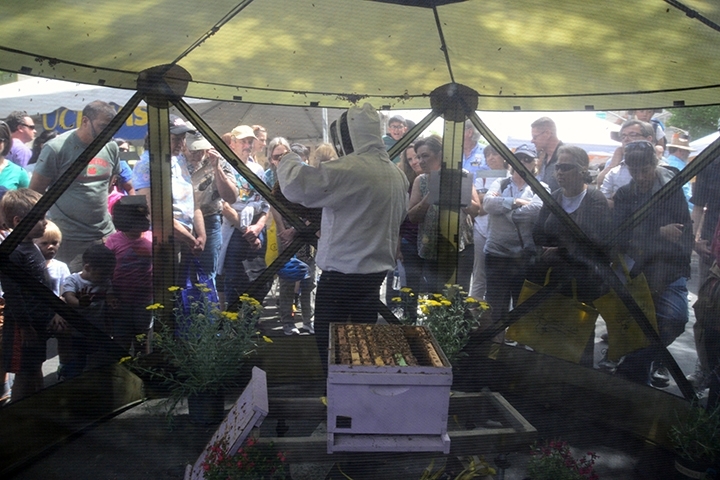 The California Honey Festival's mission is to promote honey, honey bees and their products, and beekeeping. Through lectures and demonstrations, the festival goers learned about bees and how to keep them healthy. 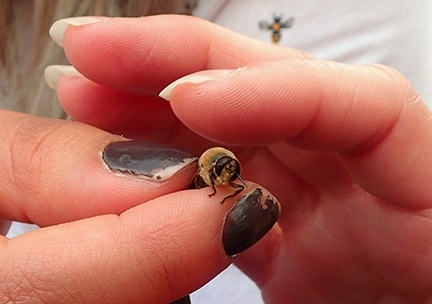 Issues facing the bees include pests, pesticides, diseases, malnutrition, and climate changes. How many attended the festival? About 30,000, said Harris. (That's not counting the bees!) Harris noted that the inaugural festival drew about 20,000. Organizers had expected about 3000. Next year: maybe 40,000 or more? Resources? 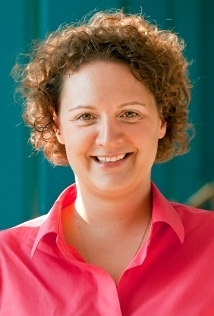 The E. L. Niño lab website is at http://elninobeelab.ucdavis.edu. Their Facebook page is at https://www.facebook.com/elninolab/. Their California Master Beekeeper Program is at https://cambp.ucdavis.edu.